There are GIFs flying all over the Internet. They often make you laugh and they fall between an actual video and a still image. If you want to make one, you usually think of either Photoshop or Gimp. Once you learn how to make them, it is not too hard. The hard part is overcoming the tremendous learning curve. If you like to take a lot of pictures, then you may like to take that video and turn it into a GIF or even take those still photos and animate them. These are a lot of fun to friends and family. Here is another new Android app that will let you do just that. 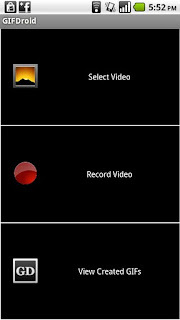 This app known as GIFDroid, allows the user to modify or change the footage or create a new footage that will be ready to head to the studio. The app lets you crop pieces out of the picture and then you easily pick your frame. You also can easily share your artistry with your Facebook, Flickr, Instagram and Twitter friends. Here are the features that Android has stated a user will be able to take advantage when they use this app. You can easily convert videos or create the GIFs from previously created videos. You can select your specific video intervals. You can various preferences such as frame delays, frames per second as well as adjust the GIF dimensions. You can pick specific pictures to create the best GIF. This is a really neat little app that won't cost you anything and is pretty easy to get around in. There are other apps that help you to make manipulate your pictures or videos. Most of these are free to the user and just take a little bit of time to learn how to use. So feel free to pick and choose the one app that will meet your needs. 0 Respones to "The GIFDroid App"